Get ready to experience one of the finest online casino gaming experience with Yeti Casino! While spotting a large snowman might not be your perfect idea of having fun and joy, but Yeti Casino with its light-hearted and user-friendly UI would definitely take the fun to an all new level! Yeti Casino is one of the most exciting online casinos today. Though Yeti entered the casino industry a bit late in 2017, we assure you, it was actually worth the wait. Yeti Casino has over 450 awesome casino games to play on any device. Additionally, like all the other industry giants, Yeti also allows you to play live casino where you can play live with your favorite dealer. And the best thing is that all the games and shuffles are generated through the random number generating algorithms. So, the gameplay is completely fair and no one can cheat. 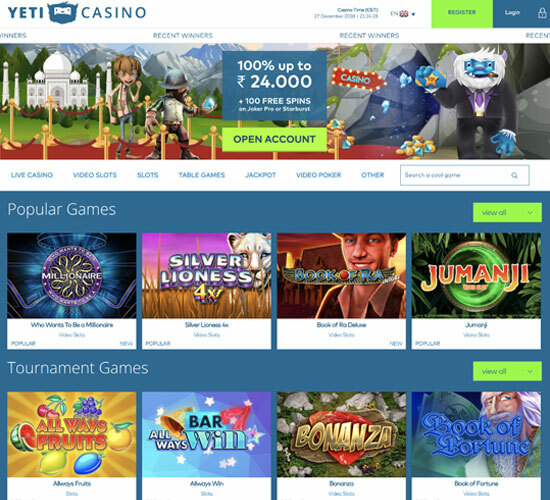 Just to make you more excited, it is important to tell here that Yeti Casino offers a 100% match-bonus of up to ₹24,000 on registering and making successful deposits. But, that’s not all. We have so much to talk about Yeti casino and its awesome features. Also, we will walk you through all the information that you need to know for registering and playing at Yeti casino. Thankfully, dealing with Yeti Casino is as pleasant as a breeze. There is no unwanted fuss, and everything is sorted and clear. To begin with, Yeti Casino allows the Indian players to play in their own currency – Rupee. This is definitely a big relief, or else, complex calculations from one currency to another are enough to boggle your mind. You might not see that coming, but Yeti Casino also allows you to make a deposit in the form of bitcoins! However, if you choose to deposit via bitcoin, Yeti Casino charges a service fee of 2.5%. Likewise, you are provided with an array of withdrawal options as well. You can choose between AstroPay, Neteller, ecoPayz, and Bank transfer. Just in case you are wondering, the minimum withdrawal amount is ₹2,000. Talking about the withdrawals, unlike many other casinos which take 5 to 10 days to process a withdrawal transaction, Yeti casino has an instant withdrawal system. You can expect the amount to be reflected in your bank account within 24 to 48 hours. This is really fast and easy, but they might ask you to verify your account first. Next, coming to the security, Yeti Casino is one of the most secure casinos which is licensed by the UK Gambling Commission, Malta Gaming Authority, and Curacao eGaming. Additionally, the casino adopts safe practices to keep your sensitive data confidential. All the transactions are processed in an encrypted server, and an utmost care is taken to protect and safeguard your interests. Thus, stay assured, playing at Yeti Casino is not only fun and all but safe and secure as well. It’s enough about banking and security. Let’s discuss something fun. Needless to say, what every gambler is most interested in is the bonus and promotions. Yeti Casino would not disappoint you in this regard and is quite generous in providing the bonus and promotional offers. To begin with, you get a 100% match-bonus of up to ₹24,000. Sure, ₹24,000 does sound great. But, they have one more surprise for new players which is 100 extra spins on Joker Pro and Starburst. So, you just have to register and make your first deposit and you are surely getting a match-bonus up to ₹24,000 in addition to 100 free spins. Yeti Casino is offering the best casino games and slot machines. It might be surprising, but Yeti Casino hosts more than 450 online casino games including video slots, slots, table games, live casinos, jackpot games, video poker and other games. Further, the website is well-designed and easy to navigate. Likewise, all the games are easy to comprehend and play. Talking about table games, Yeti Casino has the best collection including American roulette, Baccarat, Multi-Hand Blackjack, Blackjack Single Deck, Classic Blackjack, Double Exposure Blackjack, European blackjack, Casino Stud Poker, French Roulette, Oasis Poker, Pontoon and so many others. Some jackpot games hosted by the site include Divine Fortune. Hall of Gods, Arabian Nights and Mega Fortune. If you are the one who loves slots, Yeti has a lot of them on offer including the like of Allways Fruits, Allways Win, Bellisimo, Agent Jane Blonde, Adventure Palace and a lot of others. It is important to mention here that most games on Yeti Casino are powered by NetEnt. Amatic and Microgaming which is enough to gauge the quality and reliability of the platform. It is easier to get your query sorted out at Yeti Casino. Yeti has a highly trained and well-dedicated team which is available 24/7 for customer service. Also, support is available in many languages. You can contact the support team via live chat, telephone, and email. You can even fill their contact form and leave a message to their support team members. They are always active for customer convenience. In order to contact them via phone, you can give a call at +356 2033 0961. It is worth mentioning here that this is not a toll-free number and international charges may apply. Although a bit late entrant in the industry, Yeti Casino has still managed to rule the hearts of the casino lovers, all thanks to the awesome user experience that it provides. Yeti Casino was launched by L&L Europe Ltd in 2017. This in itself is a clear indication of the reliability this site offers. Talking about the gaming experience, the primary website has a good assortment of fun games. There are 42 table games. However, when you tend to play on mobile, only 6 tables pop up which could be a bit disappointing. Thus, while PC and Mac versions are outstanding, the mobile casino still needs a bit of improvement. Talking about the audio and video quality, the casino offers realistic graphics with fast loading speed. Registering yourself at Yeti Casino is simple too. You simply need to provide your email id and create a strong password. Also, you need to provide your country, address, preferred currency, DOB, gender, you first and last name and that is it. You are now eligible to play any game you want and win as much money as you want. You can use Yeti casino on your PC as well as on your smartphones and tablets. This brings us to end of Yeti Casino review. All in all, it would not be wrong to say that Yeti Casino is a straightforward gaming website which offers lucrative gaming options. Making the best out of the Amatic, Microgaming, Netent and Evolution games, the portal definitely promises an out of the world online gaming experience. What’s more? The swift 24-hour payment approvals and a user-friendly website provide a positive vibe. Unlike other casino websites, the website is easier to navigate and lists out terms and conditions and other essential information which indicates their transparency in the business. Additionally, you can feel safe and secure while playing at Yeti Casino and get quick support with their round the clock customer service. However, what makes the headlines is the welcome bonus of up to ₹24,000 to every new user in addition to various other benefits. So, register on Yeti casino and start playing now!